London, British Museum, no. 1948-4-10-5. 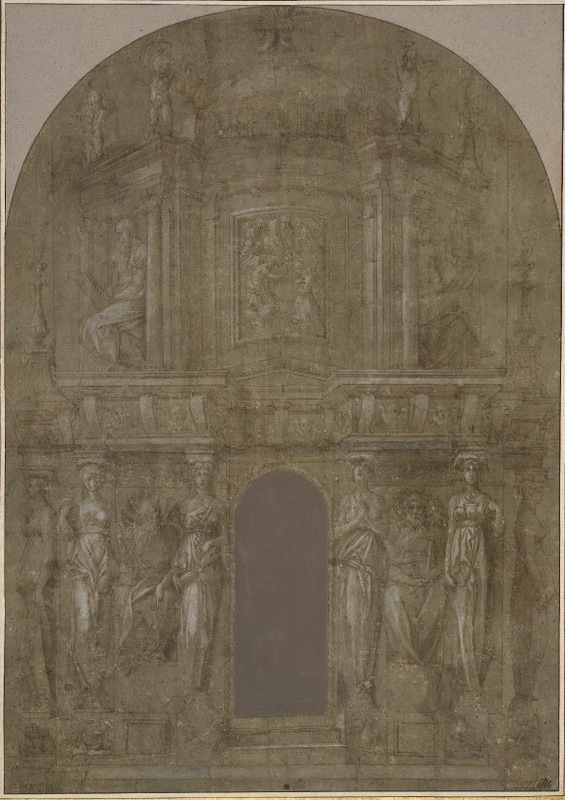 Pen and brown ink and gray-brown wash, heightened with transparent and opaque white over traces of black chalk, on light dull gray-green prepared paper, 46.3 x 33.8; laid down; wm?. 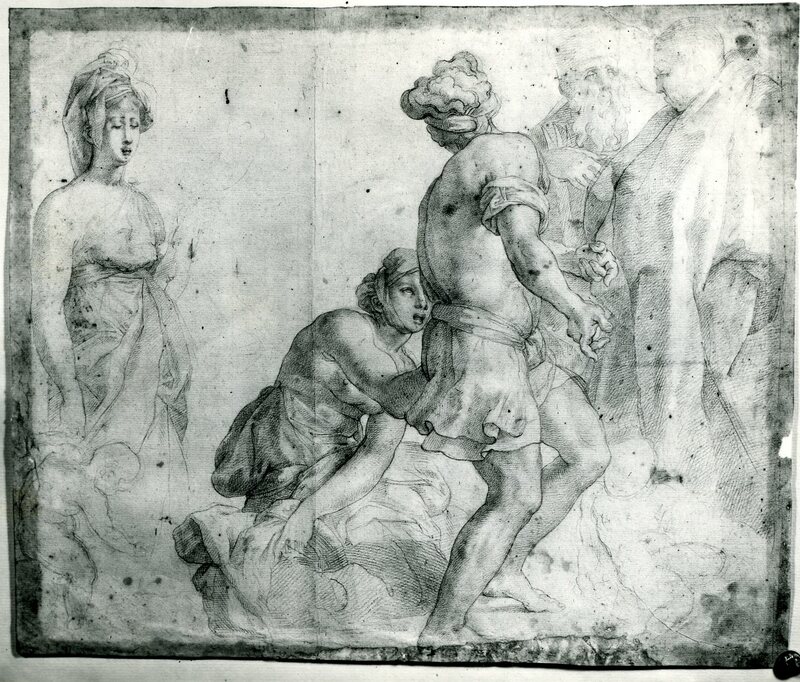 The drawing is rubbed in places and appears once to have been folded across the center. It is likely that the drawing has been cut at the top and that originally there were vases or possibly flaming urns above. 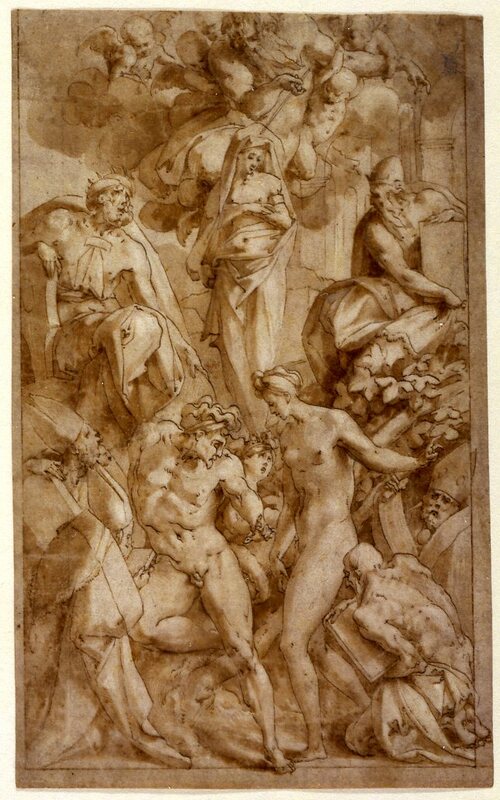 Inscribed in pencil on the mat at the lower right: 456, and on the back of the mount, in ink: Disegno Stimatis.mo del / Rosso Fiorenti.no; / era nella Collezione di / Giorgio Vasari. PROVENANCE: Vasari? (see inscription above); Jabach (see Chennevières, 1894); A. M. Zanetti (from inscription above, on which see Lugt 2992f); Marquis of Lagoy (Lugt 1710); Alcide Donnadieu (Lugt 98); Alphonse Wyatt-Thibaudeau (see Chennevières, 1894); the Marquis Ph. de Chennevières (Lugt 2072 and 2073); L. Deglatigny (Lugt 1768a); presented to the British Museum by the Vasari Society. Carroll, 1964 (1976), I, Bk. I, 203-211, II, Bk. II, 313-319, D.32, III, Figs. 91-92, as Rosso and possibly a copy; “Addition to the Preface,” 1976, as autograph. Carroll, 1966, 168-170, 171, Fig. 2, 172, Fig. 7, as Rosso, and done in Arezzo in 1529. Byam Shaw, 1976, I, 67, under no. 125, as Rosso. Turner, 1986, 149, Color Pl., 150, no. 107, as Rosso in the late 1520s. Carroll, 1987, 25, 28, Fig. 5, 162, under no. 55. Béguin, 1988 (1989), 11, 12, 13, Fig. 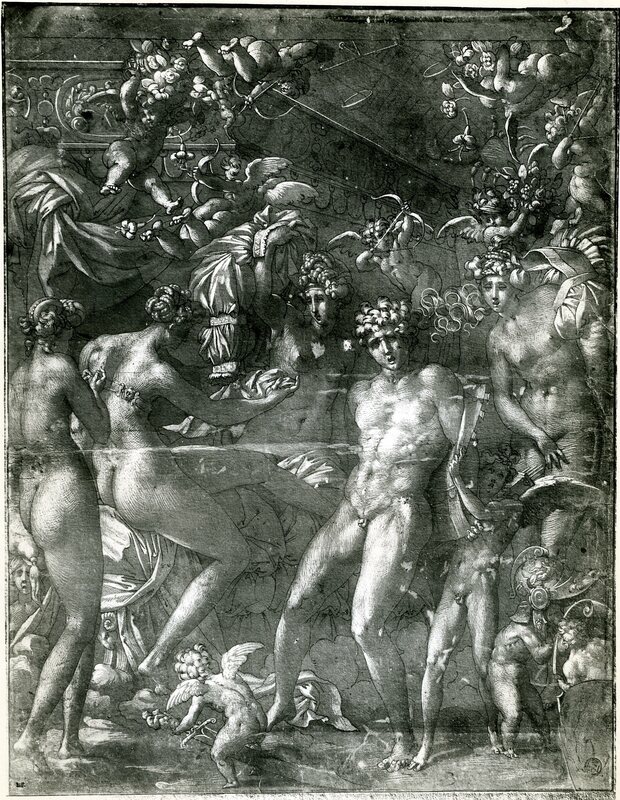 11 (detail), 14, as done in Arezzo and showing the influence of Michelangelo and Sansovino. Franklin, 1988, 323, as done in Arezzo around 1529, and as for a Dominican altar. Ciardi and Mugnaini, 1991, 150, as Rosso. Franklin, 1994, 193, 194, 207, 236, 258, 265, Color Pl. 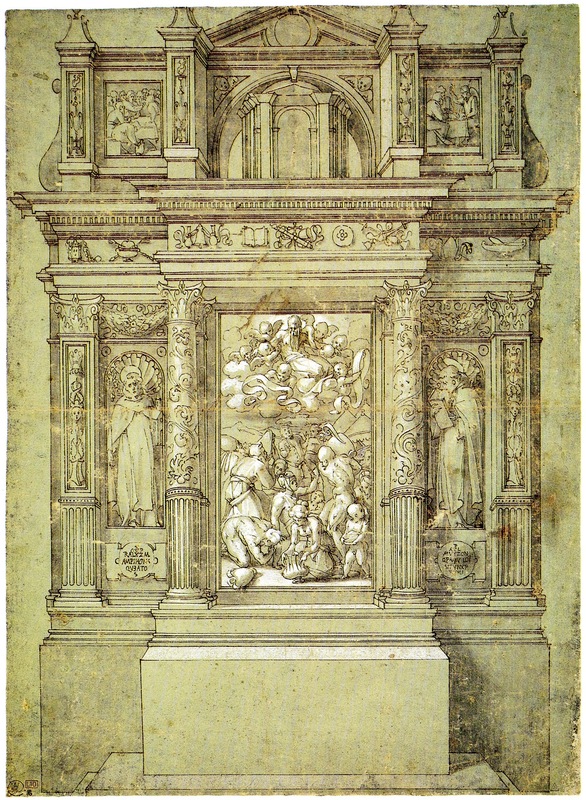 152, as Rosso’s Design for an Altar, a modello of the late 1520s, for a free-standing high altar dedicated to the Corpus Domini, and for a specific commission, and perhaps unprecedented with its Old Testament subject. 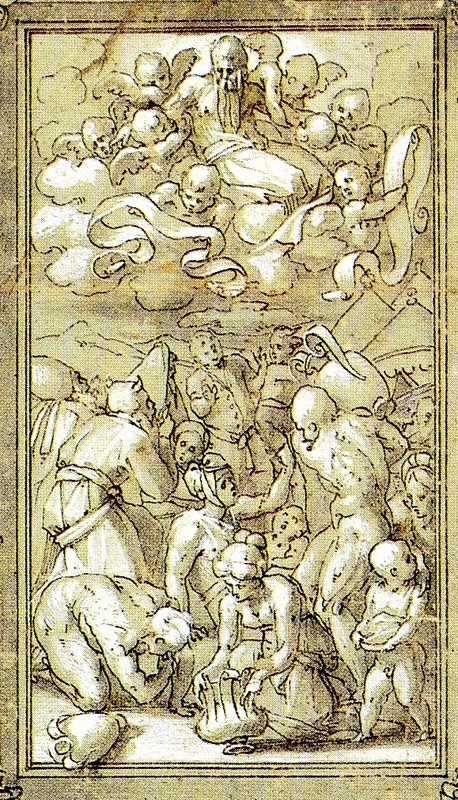 The scene of the Gathering of Manna in the center of this drawing, especially the spherical arrangement of the figures in the lower half of the scene, is similar to the Pietà of 1527-1528 in Borgo Sansepolcro (Fig.P.19a). 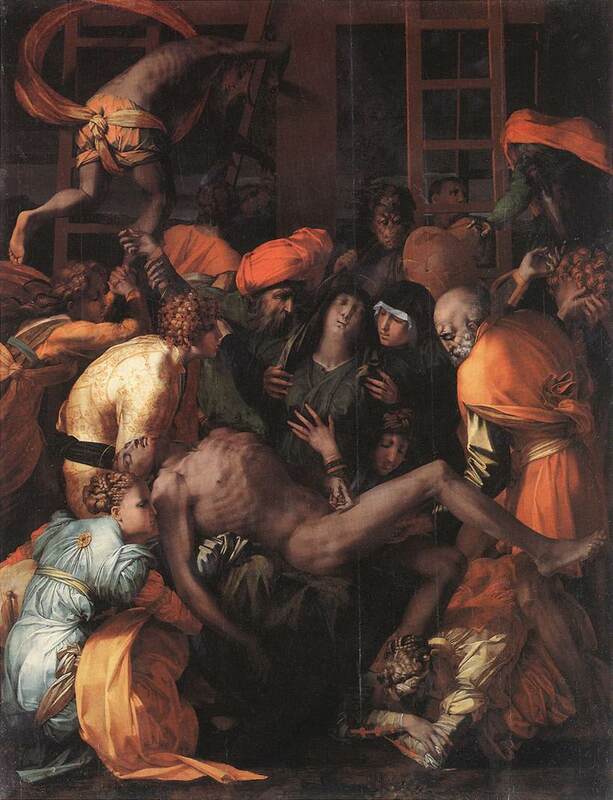 But with an upper and a lower part, and with the latter composed of standing figures at the sides and seated or kneeling figures in the center, the Gathering of Manna also resembles the Christ in Glory of 1529-1530 (Fig.P.20a). 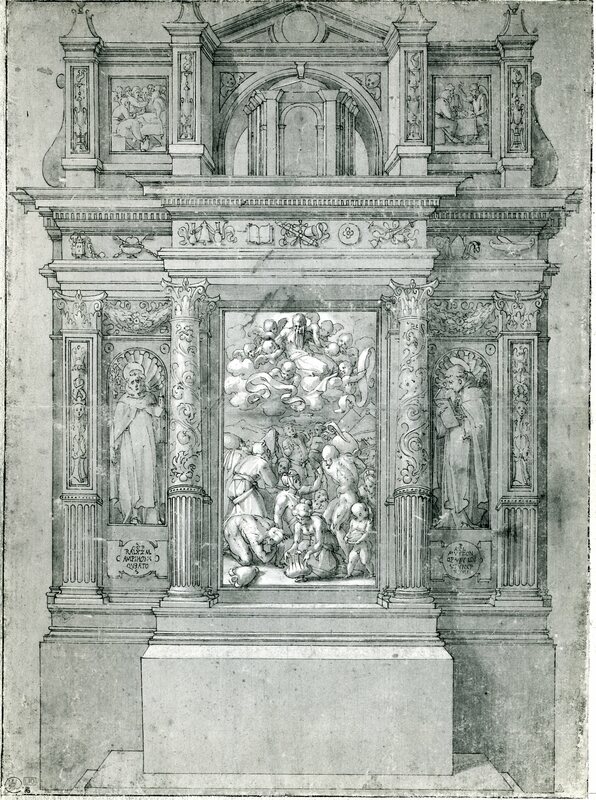 However, the activity of the composition is closer to that of the studies of 1528 for this painting (Fig.D.28; Fig.D.29) than to the somewhat more rigid arrangement in the altarpiece as executed. One is also reminded of Rosso’s Allegory of the Immaculate Conception of 1528 known from the drawing in Hamburg (Fig.D.30). At the top of the British Museum drawing the two “reliefs” bring to mind, in spite of their small size and the laconic manner in which they are drawn, Rosso’s Throne of Solomon (Fig.D.34). The not very imaginatively conceived “statues” of St. Dominic and St. Thomas Aquinas are quite closely related to the female figures in Rosso’s Allegory of the Virgin as the Ark of the Covenant of 1529 in the British Museum (Fig.D.33Aa). I had once thought that this drawing might be a copy but I have come to see that it must be an autograph work. Graphically, it resembles the Throne of Solomon of 1529 and the Mars and Venus of 1539 (Fig.D.42a). It is true that its draughtsmanship does not have the subtlety of the handling of those works, but its more regularized manner nevertheless shows the masterful touch of those other drawings. The pen lines and brush strokes of the white highlights are everywhere deftly made, and nowhere is there any sign of the overly complete definition of a form or detail that would betray the hand of a copyist. 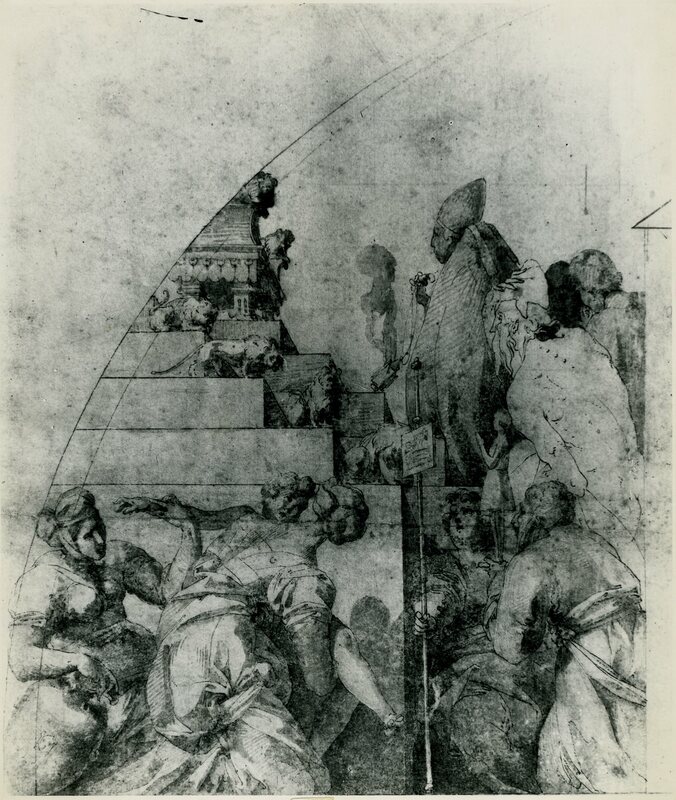 Just as the whole drawing appears to have been executed by Rosso so, too, is its entire invention of architecture and figures his. Iconographically, the scenes and figures, together with the liturgical objects that decorate the frieze, indicate that the chapel was designed as a whole as an altar specifically dedicated to the Sacrament of the Eucharist, and probably for a church of the Dominican order. The architecture, with its rich carvings, narrative “reliefs,” and “statues,” recalls Andrea Sansovino’s as Rosso could have known it from his altar in S. Spirito in Florence and from his tombs in S. Maria del Popolo in Rome. Rosso may well have known Andrea personally in Arezzo, for in September 1528 Sansovino was commissioned to design an altar for the church of S. Maria delle Lagrime in that town,1 the same church for which, two months later, Rosso was assigned to paint a series of frescoes (see Preface to D.31-34). 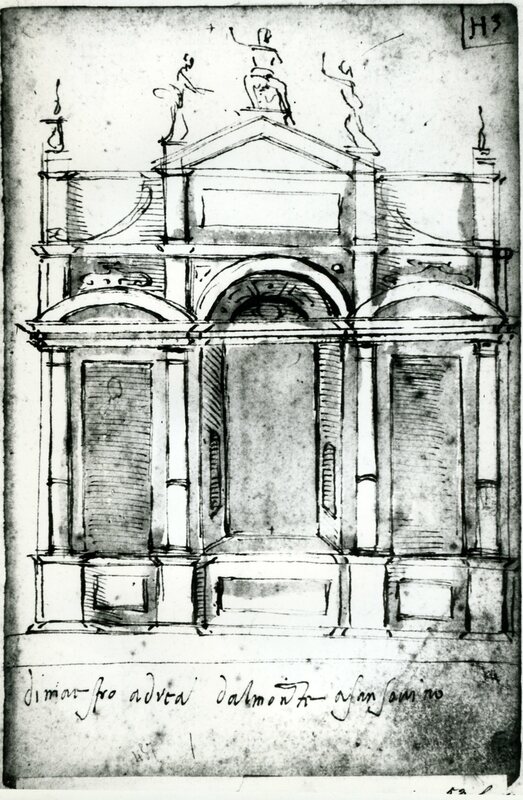 While Rosso’s chapel recalls Andrea’s earlier architecture, the massiveness of Rosso’s design possibly suggests Sansovino’s later work after the time that he began to work on the Casa Santa in Loreto.2 These references to Andrea’s early and late architecture, as well as the schematic rendering of the tabernacle set in the arch above, indicate that the chapel would not have been designed by Sansovino, although he could have given Rosso advice. 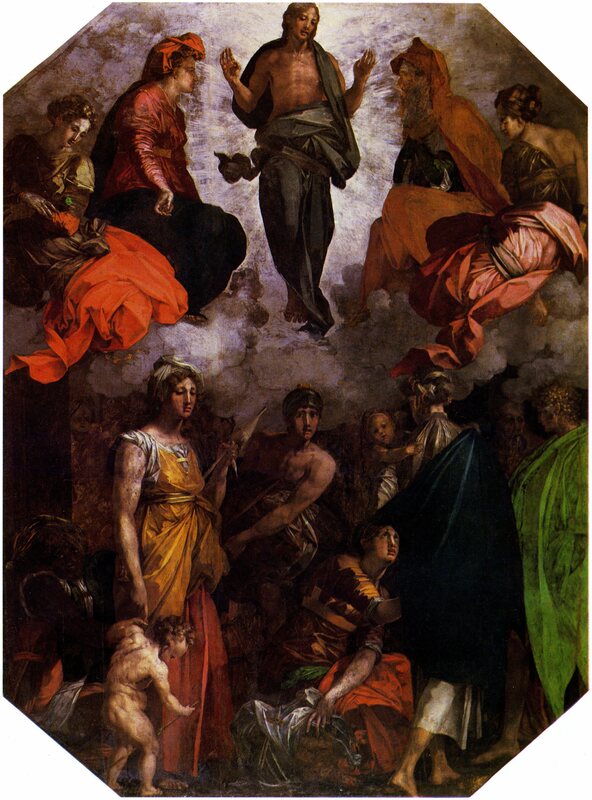 Rosso’s chapel resembles the smaller frame of his Dei Altarpiece in S. Spirito, which could possibly indicate his responsibility for the design of the latter. 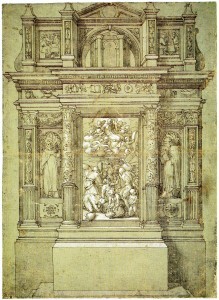 Franklin thought the design was for a free-standing high altar, which is possible. It could also have been designed to be placed against a wall, in which case it becomes, with all its parts, a kind of wall-chapel. 1 See Vasari-Milanesi, IV, 522, and Fabriczy, 1906, 90-92. 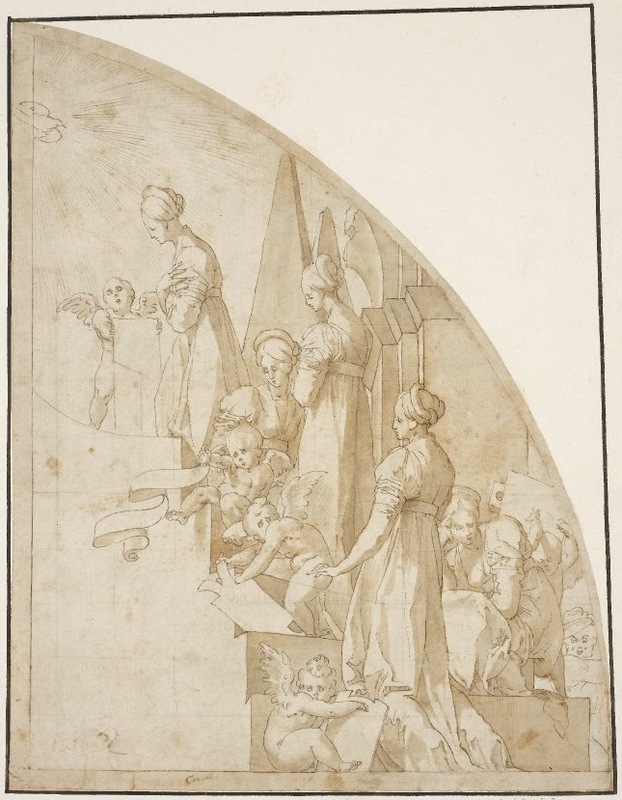 Luigi Grassi, in his notes to Vasari’s “Life” of Sansovino (Vasari-Novara, 1967, IV, 203, n. 5), mentioned a drawing in the Musée Wicar in Lille as Sansovino’s design for this project (Fig.Sansovino, Lille). In its basic tripartite scheme with an attic and pediment, it is not unlike the design of Rosso’s chapel, although Sansovino’s drawing does not have the elaborate superficial decoration of Rosso’s. For a fuller account of Sansovino’s drawing, see D.38, n. 7. 2 In Loreto, Sansovino was carrying out Bramante’s ideas at the Casa Santa (see Lotz, in Lotz and Heydenreich, 1974, 364, n. 24). Sansovino’s later style may be represented by a loggia at Monte San Savino (see Huntly, 1935, 92-93, and Fig. 65). 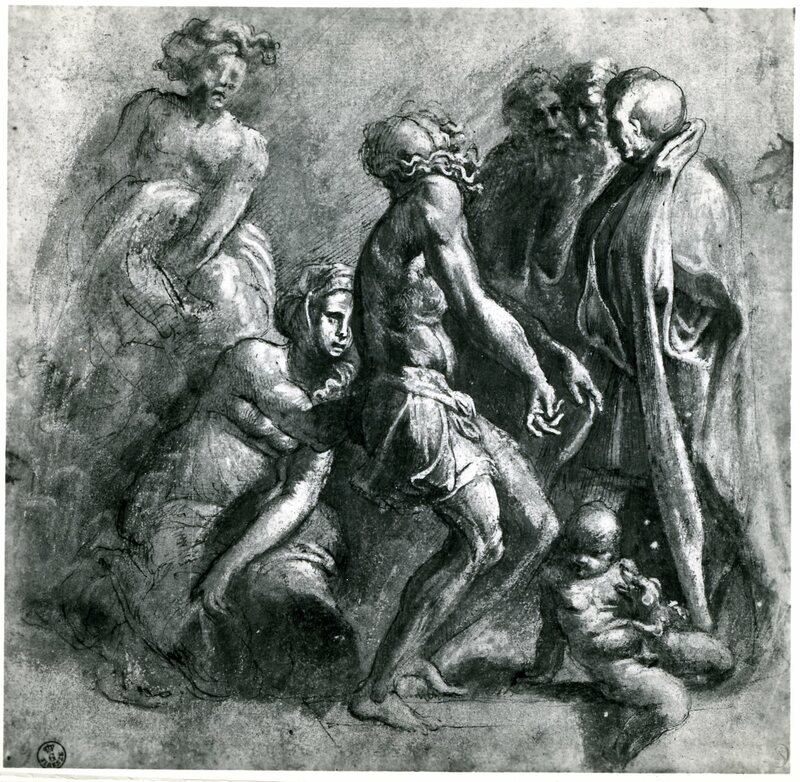 But see also the drawing mentioned in n. 1. 3 At some time prior to the seventeenth century, there was an Oratory of St. Thomas Aquinas in the Convent of S. Domenico in Arezzo for which the iconography of Rosso’s chapel is suited. See Capitoli dell’Oratorio del Convento di San Tommaso d’Aquino, eretto qià nel Capitolo del Convento di S. Domenico, e al punto stabilito, & adunato nel medismo vaso dell’Oratorio di Santa Catarina da Siena della Città d’Arezzo, 1629, ms-155 Arezzo, Biblioteca della Città di Arezzo.